This update is pretty timely for us as many team members are in San Francisco this week. During our ‘off time’ we are all looking for what to do and what is the goings on around town. Several of us grabbed the Chronicle on our iPads. 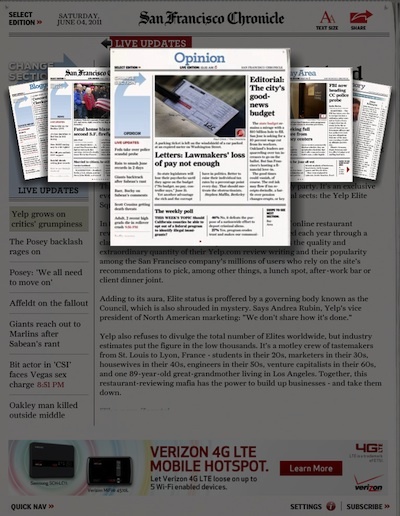 Mobile, paper free, and up-to-date the whole time. 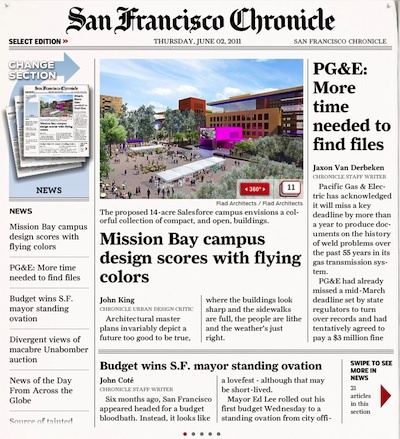 The San Francisco Chronicle app is free to install. If you don’t need it for more than 30 days, you can choose the full featured demo in-app option. 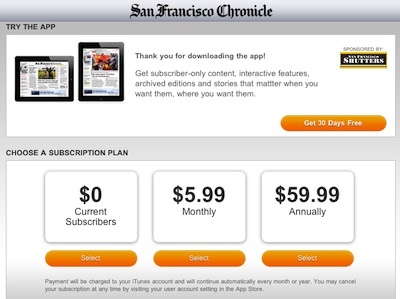 Or, if you subscribe to the print version, there is no additional charge to get all of the Chronicle’s news through the iPad. There is also the options to subscribe for a month or year’s access. We where a bit confused by a few of the reviewers. Non of us have had slowness issues, the ads are minimal along the bottom, there is much more multimedia than is possible in print and it was constantly updated everyday we used it, all day. We are not in the world of ‘everything on the Internet should be free’, but we do expect more if we are paying than the free options provide. 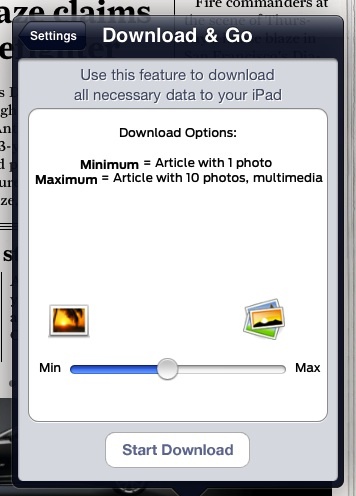 In the settings area, you can adjust the depth of news content and images that are downloaded when you connect the app to the Internet. The basic is to grab top level articles and a single image each when available. Increasing this will cause the app to run slower each time you start it up as it tries to download more content in the background. Several reviewers have mentioned the app is little more than a interface to the Web site. This might be the case, which we don’t mind. For us, it means the newspaper content is neatly wrapped up and we do not risk exiting the site (except clicking on those ads), keeping the path through more like reading a print newspaper. Jumping from area to area of the paper can be done at anytime via the button on the lower left corner of all pages. 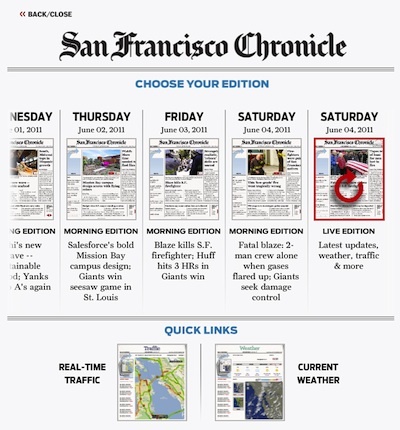 Or, one can choose the “Changing Section” which brings up a turning circle of San Francisco Chronicle areas like the section bundles you pull apart in the print version. Swipe through and stop to read the section that interests you at the time. Not all content is just San Francisco, the newspaper also covers world news so there is a lot to read every day. Tapping the short store on any page opens the full article. Most articles are scrolled up and down in a single view. We are not sure why some San Francisco Chronicle articles open as a single page view that has to be swiped side to side to move through the pages of the article. Using the Share button allows for telling your Facebook and Twitter friends about what your reading. On most article images is a small white box with a number in it, tap the box to go to more images for that article. 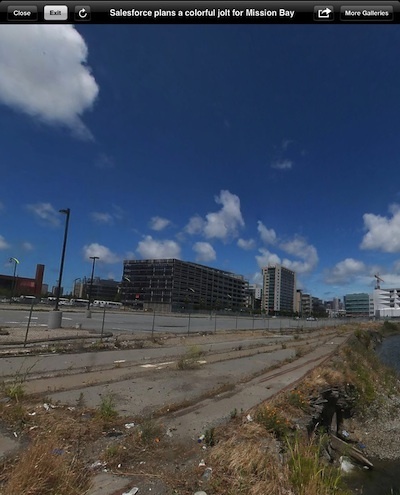 If there is a red box with a ‘360’ in it, the Chronicle has included a full panoramic image for that article. 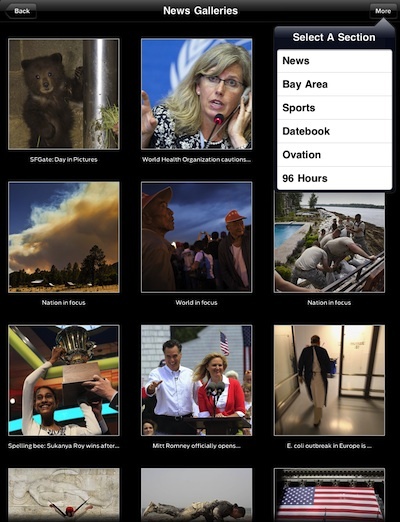 Tapping either takes you to a page within the San Francisco Chronicle app to view the different types of images for that particular article. 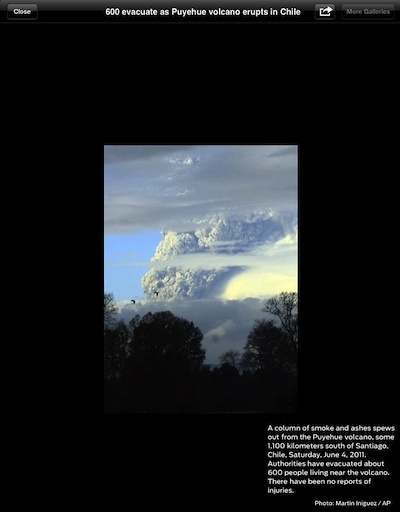 Many articles have more than one images associated with it. A single image view with helper text can be viewed. Swipe through the images or tap the screen to have the iPad app show you a list of associated images so you can jump to view only what interests you. 360 degree panoramic images take a little while to download but give you a full view of what it being talked about. These can appear from time-to-time in articles and you can choose to search through all available panoramic images… this was handy for us on our site seeing since we able to know what a lot of the popular areas would look like before we got there. All the news isn’t always just today. 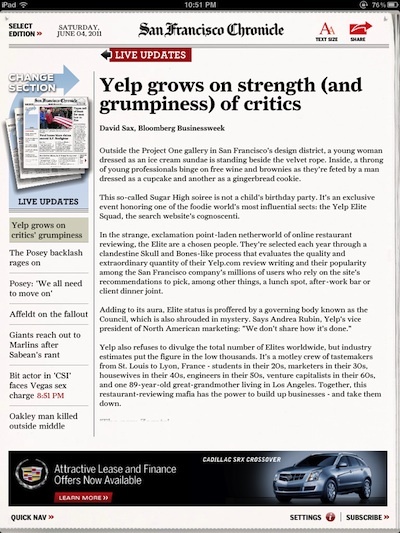 The San Francisco Chronicle app allows you to go back in time and pull articles to read from previous additions. Pretty slick when someone at lunch asked if you saw that interesting bit yesterday… now you don’t have to carry a whole week’s worth of newspapers in your bag. 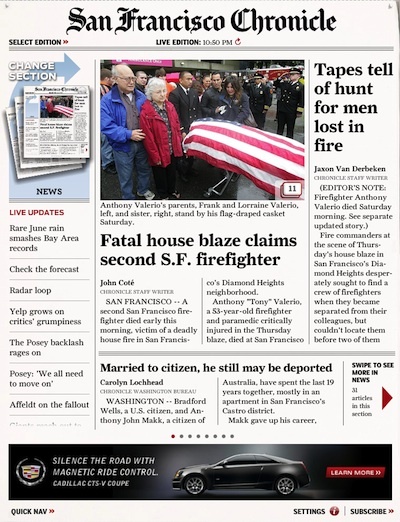 There are several features of the San Francisco Chronicle iPad app that isn’t possible through print. Searching for article by image is something that is becoming very popular with other news agency offerings so it’s a ‘must have’ feature here too. 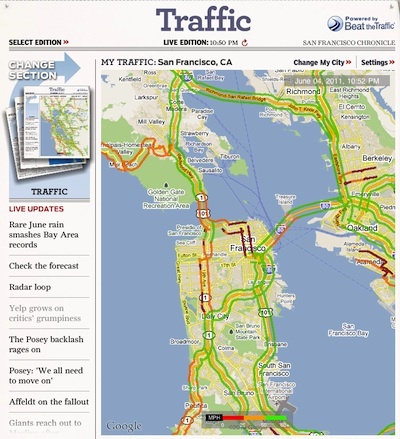 Quick access to the Weather of the area as well the traffic congestion maps are not something you normally find in a print newspaper. 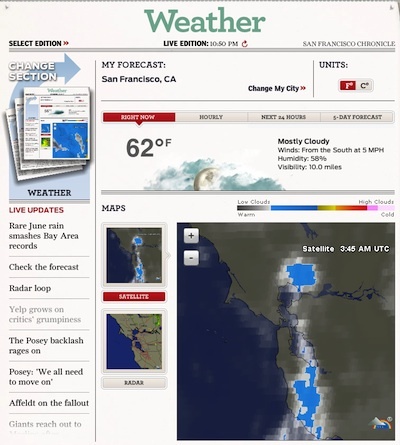 Even if there is a five-day forecast listed, it isn’t up-to-date like the live San Francisco Chronicle iPad app is. Is this app for eveyone? For San Francisco and local area folks, it should be a very handy newspaper option which is much easier to carry and is always the latest news. For folks on the other side of the world, it might be an interesting download to see what you like and dislike about iPad based Newspapers since they are only going to get more popular in the near future.